So I'm a little late in posting this, but today while doing the dishes I realized I never shared my new faucet. I know it sounds boring, but holy smokes it makes a big difference! Our previous faucet was not only blah, it didn't work well. It wasn't even fully attached. 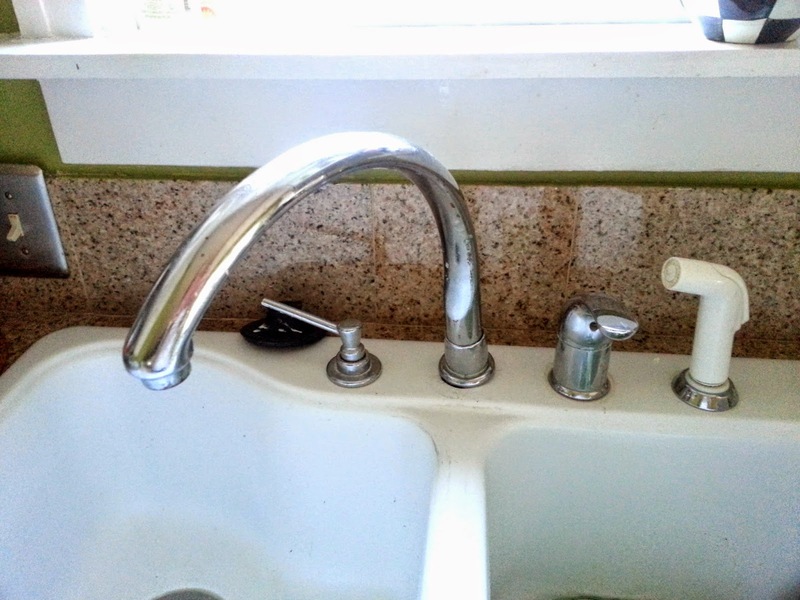 When you have a bad faucet, doing the dishes is ten times worse because you can move it where you want, the sprayer is sketchy and the water pressure is lame. A replacement was much needed! We decided to check out the faucets available our local Menards and luckily, we found the winner! I wanted something that was pretty (again, I know that sounds weird with a faucet), easy to use and that was affordable. Another thing that we were confused on was the number of holes in your sink. Ours has four (faucet, lever, soap dispenser and sprayer). We thought we were going to have to get a four piece again, but looking at them, realized you could put a plate down that covered some of the holes. I love my mom's pull down sprayer, so I wanted to find one with a similar feature. I also wanted to make sure the faucet had some character - details can make a difference. There are cool modern, farmhouse, classic and simple styles to choose from. Our look is a more classic style, to fit with our old house vibe. We narrowed down the color choice to a stainless steel to match our appliances and hardware. The chrome was too shiny and kind of clashed. Since the faucet we loved was on sale, we went for it. We went home and were very excited to make the switch. When we took out the old hoses, it grossed me out so much. I recommend changing the faucet if it's really old for the sake of cleaner water. 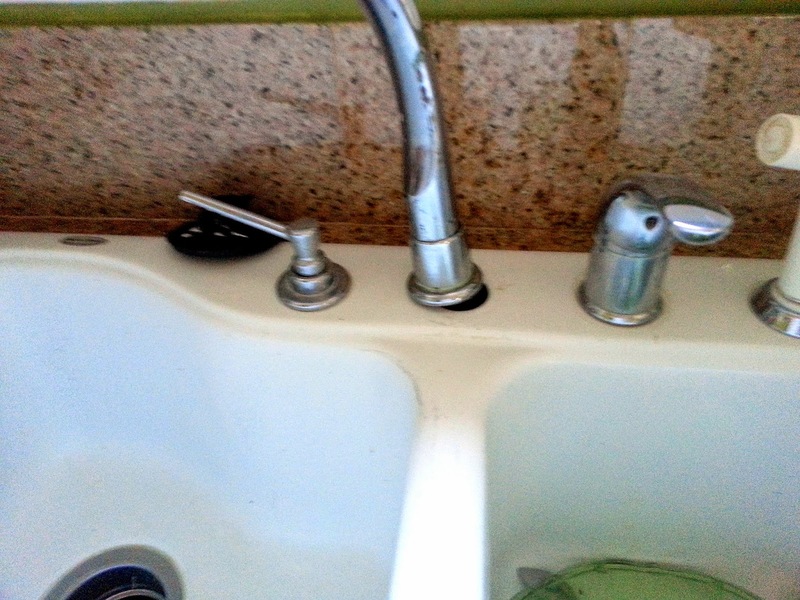 Or if you love your faucet, just replace the old hoses because they get nasty. After the difficult task of taking out the old one - no idea what the people attached this thing with - we easily installed our new and beautiful faucet! Moen Lancaster 1-Handle Kitchen Faucet from Menards. I know you are wondering why I still have soap out, but it's for two good reasons: 1. That Mrs. Meyers soap matches my kitchen so well! 2. We put dish soap in the soap dispenser. Love the pull down feature! It is weighted, so it pulls back up when you let go. I also love that the sprayer is built in! Filling my watering can or a pot has gotten so much easier, and I don't make a mess when I use the sprayer since I have more control. Plus, it's nice to look at! If you have been wanting a way to give your kitchen an affordable quick makeover, this is a great place to start! For under $200, our sink looks new. I love having the Mrs. Meyers soap out too! I just like the look of it for some reason ;) (and it smells nice)!